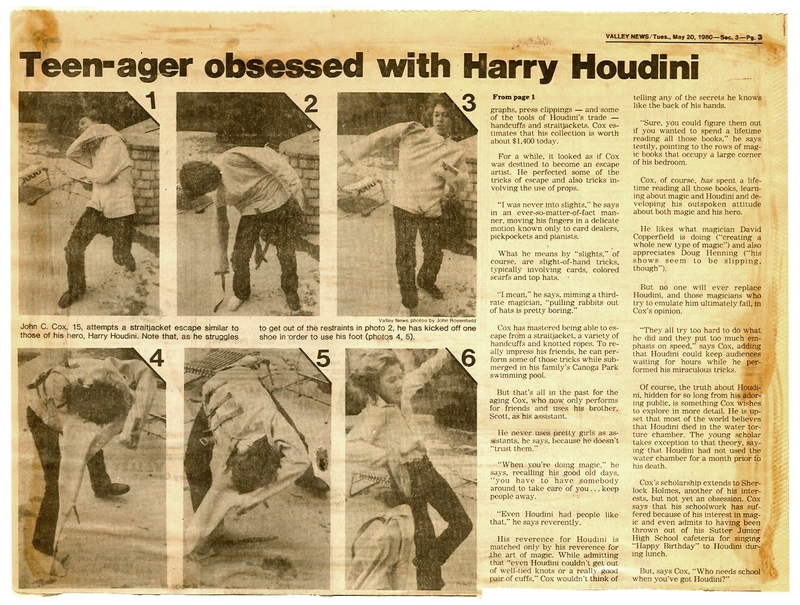 In 1980, 15-year-old John Cox told a Los Angeles Times reporter he was the third disciple of Harry Houdini. The first two, he said, were carnival worker Edward Saint and noted illusionist and author Milbourne Christopher. 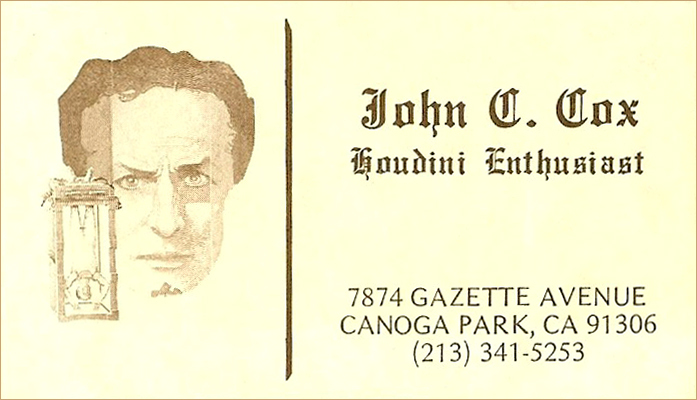 At the time, John, whose business card and stationery read, “John C. Cox, Houdini Enthusiast,” said he hoped to write a definitive history of Houdini. Thirty-three years later, the realization of that wish is Wild About Harry, the most comprehensive Houdini-themed blog on the Web today. 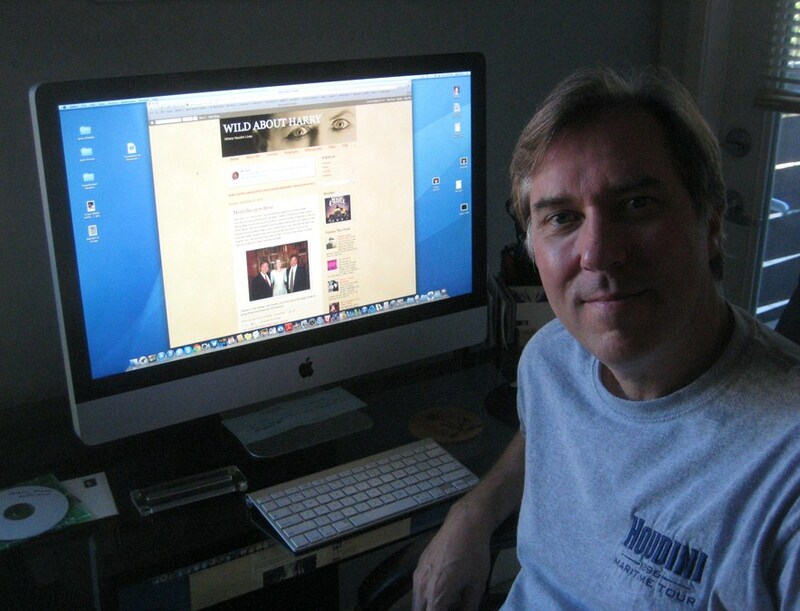 Although John launched Wild About Harry only three years ago, the blog’s origin dates back to 2005 when he created a monthly online newsletter called Houdini Lives, which became a full website the following year. But in 2010, John decided to transfer most of that site’s content from an Apple iWeb template to a more functional, smartly designed Blogger interface—the site Houdini fans and researchers worldwide are now familiar with. And to further enable the typical Houdini buff’s addiction, John has harnessed the power of social media to promote his blog and all things Houdini. At the time of this writing, John’s Twitter feed has attracted more than 350 followers while his Wild About Harry Facebook page has 700 fans. And those numbers don’t include the separate, specialized Houdini-themed Facebook pages he runs: Houdini (2,170), Bess Houdini (121), Hardeen (94), Houdini’s Movies (166), and Houdini the Miniseries (115). 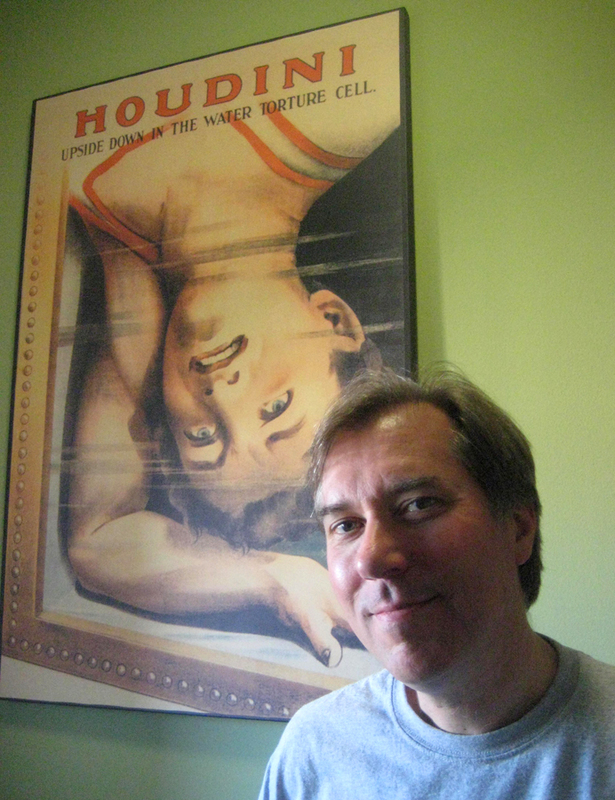 Despite having several other interests, including Sherlock Holmes, James Bond, movies, Hollywood history, and Universal Monsters, John has lived and breathed Houdini since 1975, the year he saw Houdini, the 1953 film starring Tony Curtis and Janet Leigh, and Doug Henning perform Houdini’s Water Torture Cell on television. From that point on, he was hooked, and this “double whammy,” as he puts it, inspired him to read two books that would be the first to contribute to his lifelong fascination with the legendary escape artist: Houdini: The Man Who Walked Through Walls, by William Lindsay Gresham, and Houdini On Magic, by Walter B. Gibson and Morris N. Young. 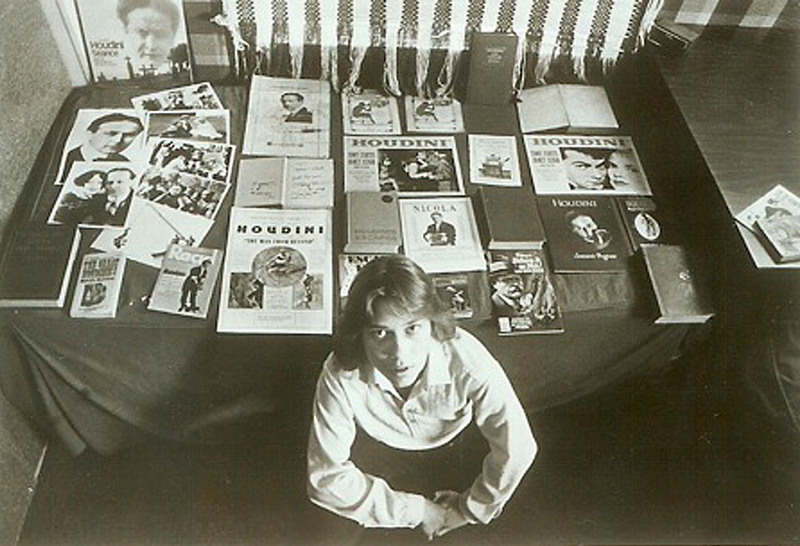 With his father’s help in the 1970s and ’80s, John, who lived in the Canoga Park neighborhood of San Fernando Valley in Los Angeles at the time, substantially added to his library and has since amassed a collection of more than 500 books and some 1,500 other items, including original autographed photos, letters, posters, pressbooks, programs, publications, press clippings, multimedia, and other odds and ends, such as a chunk of glass from an original Houdini Water Torture Cell and even strands of Bess Houdini’s hair. I had the pleasure of perusing John’s collection in September after he and I dined at The Magic Castle with actress Kristen Connolly, who was consulting us about her new role as Bess Houdini for History’s upcoming Houdini miniseries. John, who lives in Studio City about 10 minutes from the Castle, was extremely hospitable and gave me free reign to look through everything. Not only is it a great collection, but John is meticulous in organizing and caring for it. Leafing through his personal scrapbooks took me back to my childhood when I, too, saved anything and everything about Houdini and magic. Every clipping was sacred, every ticket stub and souvenir program in its place. But my meager collection pales next to John’s. His bookcases are filled with stacks of Houdini-related publications and what must be almost every edition of every book ever written by or about Houdini, including some that are autographed by the man himself. Signed photos and letters are displayed or tucked away, and Houdini posters and novelties grace some walls and bookshelves. Back in the day, the beginnings of this collection were substantial enough to earn John some publicity in a few local newspapers, including the Valley Chronicle, Valley News, the Los Angeles Times, and Hunters’ CALL, his high school paper, which referred to him as “a bit of a celebrity.” In a way, he was a local celebrity, even if only for a short time. In addition to collecting Houdini books and memorabilia, he put on magic shows at schools and other venues and performed Houdini-like stunts, such as escaping from a straitjacket and shedding handcuffs and chains after jumping into a swimming pool. He appeared on a local news channel and even performed his straitjacket escape on The Toni Tennille Show. These days, John doesn’t perform. In fact, he quit when he was about 16 years old. “I just suddenly realized I wasn’t a performer,” he says. “I was a historian, and I stopped. 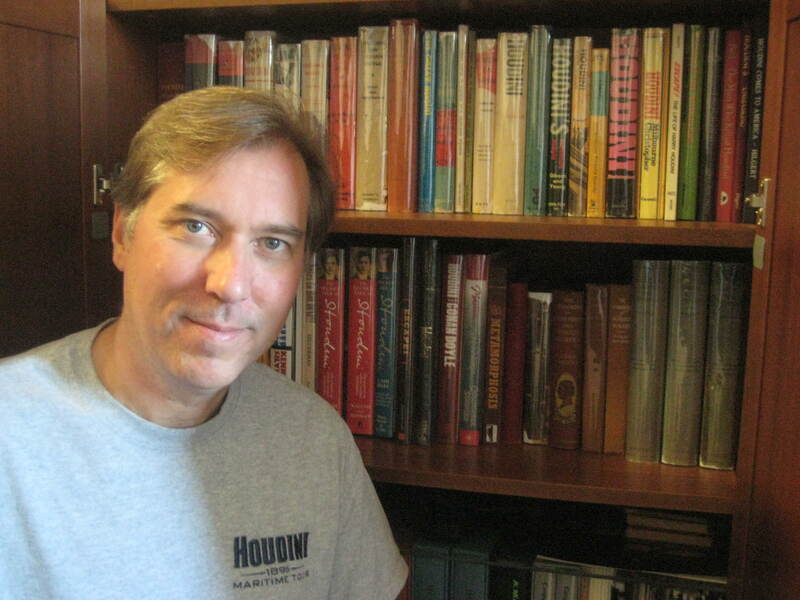 It was that easy.” As a historian, John has learned from many Houdini experts over the years, including Manny Weltman, Patrick Culliton, John Gaughan, and Sid Radner. But one of his favorite moments was meeting Marie Blood, Houdini’s niece. When he’s not blogging, John, a graduate of USC School of Cinematic Arts, works in the film industry as a quality-control technician and screenwriter. In the latter position, he has penned projects for ABC, CBS, USA, DreamWorks, MGM, Sony Pictures, 20th Century Fox, and Warner Brothers. His first produced feature film, coauthored with Agatha Dominik, was Boot Camp (2008), starring Mila Kunis and Gregory Smith. In the mean time, John plans to continue consulting on Houdini projects, giving presentations, writing articles for online and print publications, and, of course, adding fresh content to the blog. 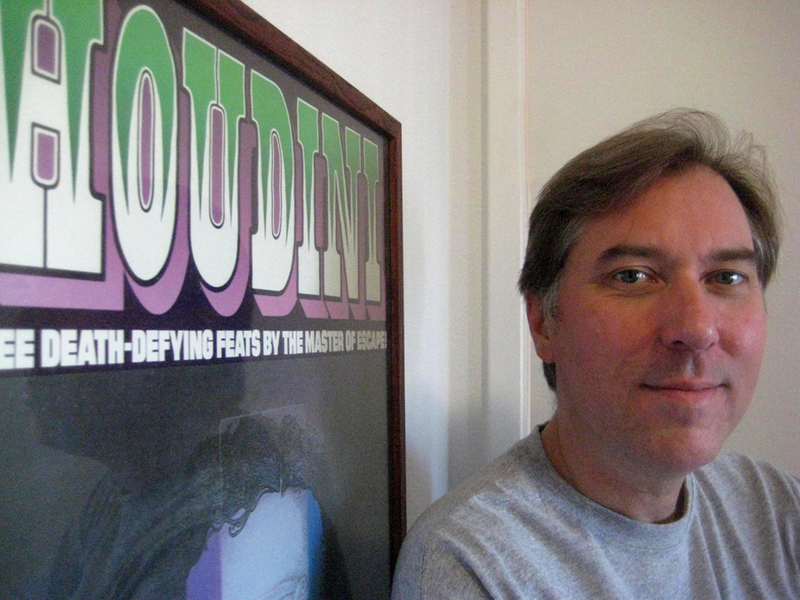 He has already appeared as a Houdini expert on the Houdini Exposed documentary; assisted NPR, BBC, and other media companies and organizations with Houdini projects; written two articles for Magic magazine; and given presentations at last year’s Magic Collectors Weekend in Chicago and the Official Houdini Seance in Fort Worth. All of John’s exploits over the years make it clear that he transcended the role of Houdini disciple long ago. Not only is he “a one-man aggregator of all Houdini news on the web,” as David Byron of The Mandala puts it, but he is easily the most prolific, active, and original Houdini blogger out there, setting a new standard for the dissemination and interpretation of information relating to Houdini. These are qualities of a leader. The only disciples are those attempting to follow his example. This entry was posted in Bess, Collecting, Collections, Ephemera, Experts, John Cox, John Cox, Letters, Multimedia, Other Escapologists, Physical, Playbills, Portrayals, Posters, Posters, Scrapbooks, Sculptures, Websites, Wild About Harry and tagged blogs, cinema, collect, collectibles, collections, enthusiasts, fans, film, geeks, gregory smith, harry houdini, houdini, houdini miniseries, john cox, kristen connolly, magic, magicians, mila kunis, mini series, miniseries, movies, studio city, web sites, websites, wild about harry, wild about houdini. Bookmark the permalink. Tom, that was a great overview of our understandably obsessed colleague, the invaluable John Cox! Looking at that business card, I marvel at what might’ve been. For years, John and I lived about 8 blocks apart, four fifths of a mile, but we never crossed paths! We could’ve collaborated. The Great Houdiniphiles! Hi David. Thanks! What a coincidence! You definitely would have had a Brother Houdini, so to speak. The funny thing is you might have had one of the newspapers John was featured in at the time but just didn’t see the article for whatever reason. What a great write up on John Cox. He is the man to go now about Houdini. Its nice to have a great blog to go and learn about Houdini. And I still learn a lot about Houdini on the blog. Thanks, John! Yes, John’s work has been incredible over the years, and I always look forward to seeing what he’s going to post next. Thanks again and Happy Thanksgiving! Hey John! I’m so glad to hear your family liked it! And you’re more than welcome. Your work is second to none, and this type of profile was long overdue. I hope you had a great Thanksgiving. I believe I have just purchased in its original frame a Houdini publicity photo at the time of his San Francisco performance in 1899. He would have been in his mid 20s. Hi Jim. Thanks for the comment. Sure! I’d love to see the photo. You can send scans to [tom] [at] [houdinimuseum] [.] [org] (address broken up to prevent spam bots from harvesting it).